Learning so much about water has caused me to reflect upon my own experiences with water throughout life. 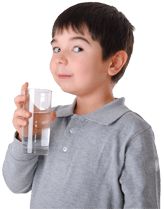 As a child I don’t remember drinking water regularly, but I assume my parents gave me what they felt was clean water. Mom? Dad? Through my early teenage years I spent several weekends swimming at the public wave pools and waterslide parks with family and friends. I remember how red and sore my eyes were after swimming there. My skin, which was usually smooth and oily, was dry and rough afterwards. At least I wasn’t drinking the mass amount of chlorine in that water, but I can imagine the effect it would have had on my insides since my outsides were complaining! My father has always cared about what his 4 children took in, through food, movies, life experiences, etc. My grandfather has always been a salesman. It seems like every time we visit him during the holidays, he’s advertising the new and latest product and convincing us that we need it. The last time I saw my grandpa he was selling water pitcher filters! Way to go grandpa! When he invited my husband and I to dinner, we saw the filter sitting on the restaurant table (a smart move!) so he could have his filtered water wherever he goes. To our surprise, after he gave us his presentation about why this is the most effective low-cost water pitcher that we could buy, he attempted to convince our waiter to buy it too! Up until now, I have been misinformed about the harmful substances in most drinking water today. I knew there was chlorine in several municipally treated water sources, but fluoride and pharmaceutical drugs?! Why? I used to think bottled water was safe until I saw a powerful documentary called “Tapped”. It exposes many important issues about the bottled water companies and I would highly recommend it to any health-conscious person. Thanks to many high quality products, several of the harmful substances in our water can be filtered. People everywhere are becoming more aware of this and they are making the right choices to change their circumstances. Water is a central part of all life. Whether we know it or not, everyone is affected by it: Our loved ones, our food, literally everything that sustains us comes down to a reliance on clean and healthy water! It is an honor to play a role in helping people make the decision to improve their lives by becoming friends of water.